Human Hair Wigs & Hair Pieces Can Be Salvaged Too!! Got A Tangled Human Hair Wig That You Love ? We service clients who have to wigs or custom fitted wigs due to lupus, alopecia or who are undergoing chemotherapy for cancer. 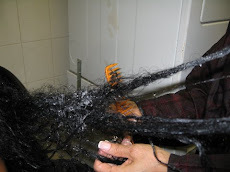 Send us your matted wigs and we can salvage them like new. We used the Take Down Remover Cream on this tangle wig- Check out the pictures below of a recent client who sent us a wig in a birds nest matted ball. Looks scary!!! and to allow the Take Down cream to penetrate faster and deeper. It took 6 hours to comb through all the matted hair and tangles. We worked from the outside of the matted areas first by pulling small strands of hair out little by little. Very Tedious work, however we could not have done it without the Take Down Remover. Here are the After pictures- The wig looks great. After using the Take Down Remover Kristen's beautiful hair was detangled safely, saved and restored. Cutting is not an option! Hi! How are you? I finally am back to feeling a bit like my usual self. The stress of what I have endured has taken a toll on me. I am so glad that we had the opportunity to meet, although under such terrible circumstances. I want to thank you, once again, for all your patience and knowledge with the situation we had on hand with Kristen's hair. I will never forget you and have been talking about you since we met. I wish you the best of luck with your business. Keep in touch - drop me a line from time to time. If there is anything I can do as far as a testimonial, please let me know.